The Bolpur Project of TSRD was its starting endeavour in the year 1969. Late Pannalal Dasgupta, founder of Tagore Society for Rural Development started development work in Bolpur block of Birbhum district through repairing the embankment of the river Ajoy with the help of local youth. The Bolpur project of TSRD geo-physically remains within the Chhotonagpur plateau. Soil type is older alluvial and laterite. The project initiated in 1969 carried on modest interventions by organizing the people for flood protection, creation of additional irrigation facilities, afforestation, helping people to become self-reliant by organizing grain bank and other activities. The project has a model agricultural farm for sustainable agriculture. The nature of interventions gradually changed at time. The project coverage now extends to 220 villages. The present focus of the project is to promote sustainable livelihood of the poorest section of people of its project command area. The Bolpur Project of TSRD is working for comprehensive development of the downtrodden people of three blocks under financial support of different donor agencies, like OPEC Fund for International Development, Jeniva, state Government of West Bengal and local collection. 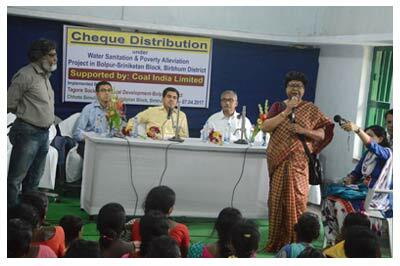 Coal India Ltd. extended a project support amounting Rs.9385000 for Tagore Society for Rural Development-Bolpur branch. 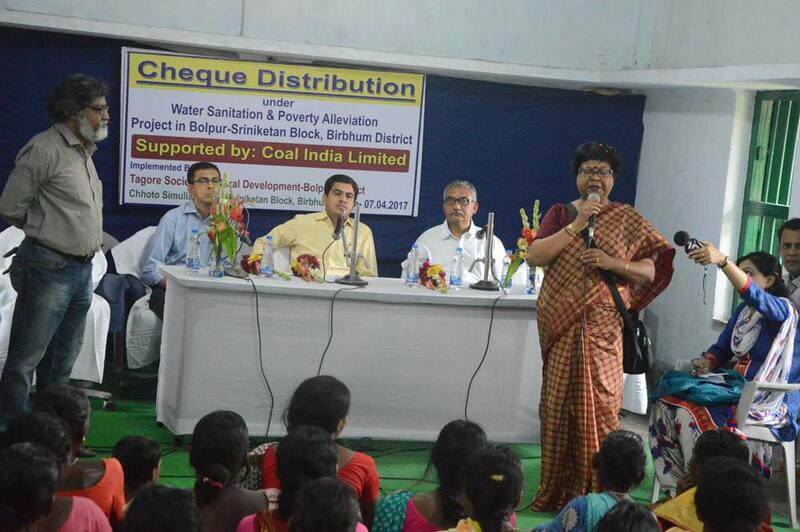 This is a CSR Initiative of Coal India Ltd. towards poverty alleviation & water-sanitation. TSRD select 500 poorest of the poor households from Bolpur-Sriniketan block and provide trainings on health & hygiene, water-sanitation and animal resource development. In the cheque distribution event the District Magistrate of Birbhum Mr. P. Mohan Gandhi, BDO of Bolpur-Sriniketan block Mr. Saumik Panigrahi and Mr. Arup Sengupta, Manager (Personnel) CSR Division, Coal India Ltd. were present and they distributed cheques of Rs.6000/- to each of the 250 women beneficiaries who were present in the programme on 7th of April 2017. TSRD will re-excavate 10 ponds of the block, install 10 deep tube wells and construct 110 house hold latrine through this project support. Poverty eradication and Women Empowerment through Agriculture Development.